The author, John Terracuso, gave me a copy of this novel in exchange for my review. Michael Gregoretti is insecure, whiny and a bit bitchy and from the moment he said that he identifies with every role Eve Arden played I knew we were soulmates. I experienced this novel while stuck at my parents home missing the family dinner flying high on Nyquil and black tea. “A Fool Among Fools” was a funny, tender, sad and happy tale of a man not sure of where his life was taking him and if he should go quietly. The driving force of the novel is the character of Michael. He’s a character that feels quite authentic. There are characters that seem slightly more off-center. Gwen, the hated boss, is perhaps a bit over the top but not so much that she comes off as a caricature. She throws ideas at her “team” that she thinks is brilliant and expects perfection and for their work to contribute to the advancement of her career so it must adhere to her questionable taste. Her motives are understandable and Michael’s agitation with her is also quite easy to understand. Michael’s roommate, Anthony, could easily come off a stereotypical 1980s Italian Queen, but Terracuso imbues him with a vitality and unique spirit that makes Anthony a truly compelling character and cheer squad for Michael. His work life comes off as a real experience and is the impetus for many big laughs in the work. Many of the ideas suggested by Gwen seem to be a tongue-in-cheek nod to what advertising has become. Though set in the 1980s, Terracuso manages a work that comes off as simply nostalgic instead of dated. Michael goes on a date in his 501s and Gwen smokes in the office. More than one of the characters is into vintage and Michael has a love affair with classic Hollywood. A Fool Among Fools is a very human story. In this character-driven tale it is essential for the reader to connect with Michael and, as stated earlier, I did. He is flawed and human but an easy character with whom to sympathize and to want to succeed. He works hard, honors his mother, loves his grandmother and is looking for a happy ending. This debut story reads as a memoir. There are big moments but they are not exaggerated for entertainment purposes but all about getting to know this great guy who is living his everyday life. 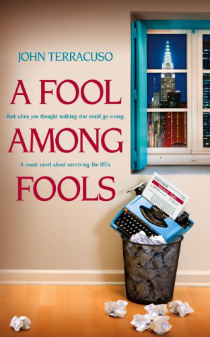 A Fool Among Fools is the first novel by author John Terracuso. You can connect with John Terracuso on Goodreads and Facebook.